Qui est le mystérieux auteur de ces souhaits d’anniversaire?! Unfortunately I didn’t have this person’s number in my address book, so I wasn’t sure who he/she was. I thought about it that evening – who has my number and knows about the blog? And whose number wouldn’t I have saved? Perhaps someone who had shown me a room when I had the blog address in my email signature? Or someone from a conversation exchange who I forgot to add to my address book? I searched for the number in my email, but nothing showed up. I had no idea – I could think of a couple of likely culprits, but their names were already in my phone. Thank you . . . I’m sorry but I don’t have your number saved in my phone. Who is this? Re: Thank you . . . who is this? I can’t wait reading such post! Who would you like it to be? So, mysterious texter, here is the post. As far as my educated guess goes – I’m pretty sure that you’re French because there were some slips in your English, and you also managed to do an acute accent over the first ‘e’ in mystérieux (I have no idea how people do this in texts – I probably need a French phone to do it), though you did forget the cedilla on the ‘c’ in français . . . I also think you’re probably a man, because you wrote ‘le mystérieux’ instead of ‘la mystérieuse’. As you see – I haven’t gotten far. I’m starting to think that it’s someone whose number I have, who is just using a second number to mess with my mind. Does anyone else out there have any ideas? Mr Frog (apologies to Petite Anglaise for stealing the name, but as he used it in his comment, I’m not sure I should reveal his true identity) and I did a Conversation Exchange back in early August. We met at a café between Chatelet and Hotel de Ville called Café Livres, where all of the walls are lined with bookshelves that people can borrow while they drink their coffees. His English was excellent – by far the best of any of the people I’ve met through Conversation Exchanges so far – and he was a very entertaining conversationalist. I even found it quite easy to speak with him in French, which was a boost to my self-esteem as it happened days after my Mon français est un escargot moment. Following the text confirming his identity (why didn’t I guess? I thought I already had his number! In hindsight it seems so obvious – no one else would have made the George Clooney job) we met up last night. As we sat in a small garden in the Marais, he told me that he had gotten me a birthday present, but that I needed to guess what it was based on our conversations so far, and what he knew about me from my blog. I’m terrible at games like these – when I think about an easy present that someone would know that I’d love, it’s generally food, but I hadn’t written about this in my blog – and was shooting in the dark. Vegemite? An Eiffel tower keyring? A chocolate eclair? No. Now I was stumped – something about my life, in my blog, that started with L or B . . . “books, or livres?” I asked. No. They were decent guesses, but not the right one. “Lingerie?” I asked. He laughed and said no, and that I would have had to have been with him. It also would have sent a rather unusual message from a married man . . . but this is France! In the end it was some English breakfast tea – the ‘L’ word was London or Londres and the ‘B’ word was Big Ben, the company that makes the tea. A perfect gift, considering the falling temperatures in Europe. So merci Mr Frog! Now hopefully my parents will send me some Tim Tams that I can dunk into this tea . . .
Quite easy to do the accents on an English iPhone. But it wasn’t me! 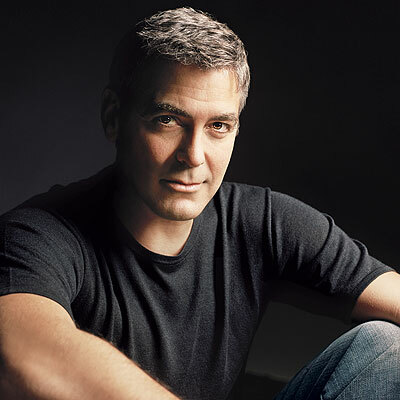 George Clooney on the other hand would be very nice.